Humans, along with our closest relatives chimps and gorillas, are pretty much the only animals that have fingerprints. 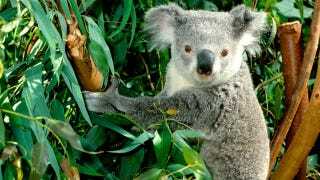 The only other is the koala, an adorable marsupial that is separated from us by 70 million years worth of evolution. Since we share these distinctive marks with our primate cousins, it's quite likely that fingerprints first evolved with our common ancestor several million years ago. But that isn't the case with koalas, who are alone among all marsupials in having these prints. And it's not just that our fingerprints are roughly similar to koalas - they really are identical. A trained expert would have trouble telling human and koala fingerprints apart, even using a microscope. You can see a comparison of koala and human fingerprints on the left. While the two look quite similar in the larger view, it's under the even higher resolution of an electron microscope that they really look pretty much indistinguishable. "Koalas feed by climbing vertically onto the smaller branches of eucalyptus trees, reaching out, grasping handfuls of leaves and bringing them to the mouth. Therefore the origin of dermatoglyphes [fingerprints] is best explained as the biomechanical adaptation to grasping, which produces multidirectional mechanical influences on the skin. These forces must be precisely felt for fine control of movement and static pressures and hence require orderly organization of the skin surface." As always, I think the real takeaway from all this is quite straightforward: the next time fingerprints are found at a crime scene, investigators need to consider the possibility of super-intelligent koalas. And if they don't find any fingerprints at all? That just means the koalas are even smarter than we thought.